We now have 1,795 subscribers. My apologies to those who sent items for publication that didn't make it into this issue; I've been busy with my kids and their basketball games this weekend, and never got fully caught up. 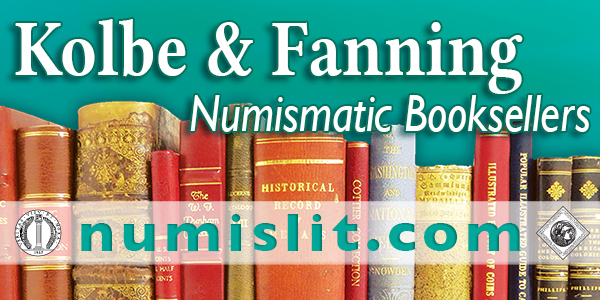 This week we open with numismatic literature in Bill Rosenblum's sale, one new book and two reviews. Many thanks to Dave Harper for permission to republish three items from Neil Shafer's recent column. Other topics include sculptor Oscar Nemon, Mint Director George N. Eckert, design perspectives, and upcoming numismatic auction sales. To learn more about Nazi counterfeiting of British currency, David Litrenta, the last days of the Confederate treasury, and Mandarin Hesing of the Junk Keying, read on. Have a great week, everyone! 453 Burke, Bryan. 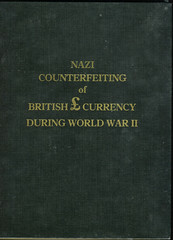 Nazi Counterfeiting of British Currency During World War II: Operation Andrew and Operation Bernhard. 1987. HC, #323 of 1000 copies printed. Long out of print. As new. Plus the 1981 English reprint published by Jorgen Somod of Denmark of Report on Forgery in Sachsenhausen Concentration Camp which is the December, 1945 report by Julius Sem and Joseph Meyer for the Czechoslovak Ministry of the Interior. The Burke book has long been considered the definitive study of the Nazi plan to bankrupt England. The last Burke book we offered, in our sale 33C, brought $125 on a $40 estimate. $125+? I am very pleased to announce that the long awaited 3rd edition of U.S. Civil War Store Cards is at the printer and should be available for distribution by our book manager in late December. The 3rd edition is 664 pages, heavily illustrated in full color, and includes many merchant bios, and revisions. 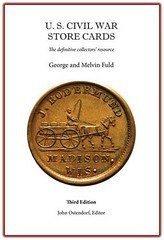 It is a must have for any collector of Civil War store cards. The CWTS is now accepting pre-orders at our website, www.cwtsociety.org. This month’s column is devoted to a discussion of two newly released books, one on Russian notes and the other on U.S. large-size currency. Volume VI - Volga and Ural Provinces, Siberia (Part 1) and Far East (Part 2). 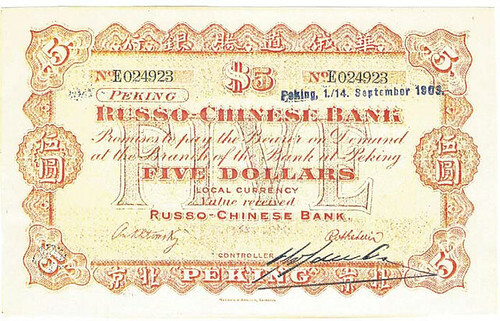 This last Volume VII covers Russian- Related Currency Notes in China including general, specialized and private issues. Interest in Chinese notes of all sorts has mushroomed to unprecedented heights in recent years, and this catalog will only serve to increase such interest as it provides explanations for many pieces already in the spotlight. 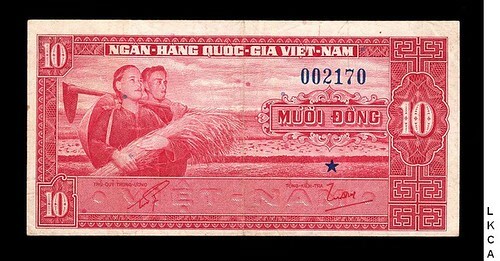 Some of these notes have appeared in recent auctions and are bringing record prices. One major component of all of Istomin’s catalogs is that they provide detailed coverage of all the historical facts behind the evolution of the issues presented. Volume VII is no exception; the introductory sections go up to p. 49. There follows a parade of major bank rarities that make one’s head spin. I do not know how the author could have located all these pieces, many of which I had never seen before. Their inclusion is more than enough reason to obtain this book. Another major accomplishment of this book is the compilation of information and illustrations of so many hitherto obscure local issues. In previous volumes Istomin has avoided getting into details about these kinds of issues, but here he has gone after them as a major section of his research. Many of them have no value guides, so you do not know what the Russian collectors’ opinions of collectibility and value are. But one thing you can gain from such listings is sure—that they are exceedingly difficult to obtain at any price. Anyone wishing to add this volume to his library should contact the author by e-mail at istomin1956@rambler.ru direct. The second volume is co-authored by two highly respected researchers, Carlson Chambliss and Gene Hessler, titled, The Comprehensive Catalog of U.S. Federal Large-Size Notes, 1861-1929. This most impressive large octavo softbound tome provides a thorough treatment of all U.S. Federal issues from the designated years, with illustrations in full color throughout. While the authors have come up with a numbering system of their own, they do include the well-known and widely used Friedberg numbers for each variety. The one feature about this finely presented catalog that impresses me the most is the extremely detailed introduction. The first 12 pages contain a wealth of information on every aspect of the facts behind each different issue of large-size U.S. paper money. 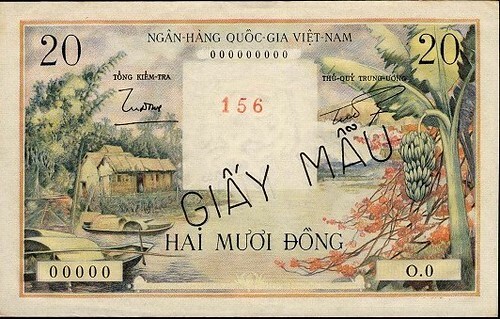 Star notes, mules, signatures, errors, fancy serial numbers—all that and more is included. I cannot imagine better coverage in any other volume. 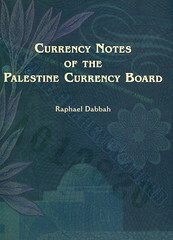 The arrangement allows for easy use in finding the type and variety of note one may be trying to locate. The authors have made extensive use of research data provided by a number of highly placed specialists in their respective areas. The result is a great concentration of facts all gathered together in one place. As mentioned previously, practically all illustrations are in color, which of course is the best way to help describe the notes. Not too many years ago such a book with notes in color could not have been published. These images are really beautiful and serve to enhance greatly the appearance and total value of the catalog. Value guides are provided where possible throughout all listings. While they seem a little optimistic to me, I must admit that I have not kept up with the demands of the market, and these values may be fully justified. Rarity is given where values are not possible to give. I would consider this outstanding catalog a “must have” for anyone seriously interested in really getting to know these notes. It is available from Carlson R. Chambliss at crchamblis@verizon.net for $35 postpaid. His address is P.O. Box 804, Kutztown PA 19530. Om Wednesday I had a telephone call from Dr. David Litrenta’s wife informing me that David passed away very recently. 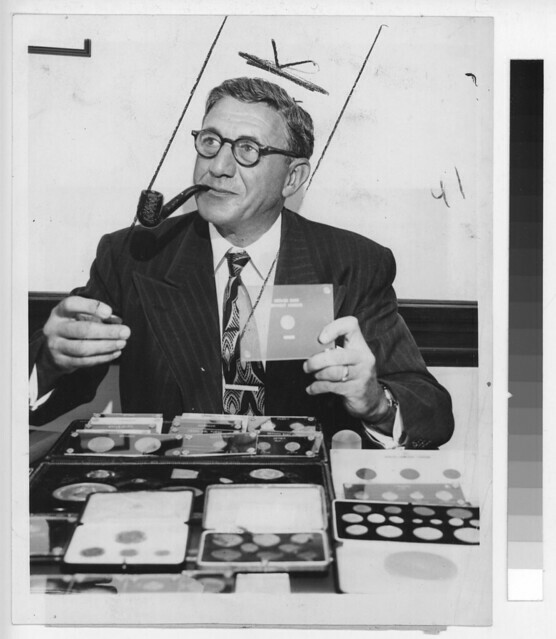 Dr. Litrenta was an avid bibliophile and coin collector. His various collections were sold by Heritage and his reference books were sold in several Lake Books mail-bid sales. The Litrentas were regular visitors to their Florida property here in Pinellas County, Florida and I had many pleasurable meetings with them. The good doctor loved his books and was always happy to pass them on to others so that they might learn. He will be missed. David Edward Litrenta, M.D., 78, passed away at his home in Shrewsbury surrounded by family on November 15, 2014, around 2 p.m. He was born May 4, 1936, in Baltimore, Md., and was the only son of the late Catherine and Ernest Litrenta. David is survived by his beloved wife of 59 years, Shirley Frances Litrenta (Spleidt); and seven children. David fulfilled his childhood dream of becoming a physician when he graduated from Washington College and University of Maryland Medical School. He went on to practice for over 53 years. His love of practicing medicine was second only to his love for his wife and family. After medical school graduation, David trained at York Hospital and entered family medicine, with a practice in the York area. He later transitioned into specializing in preventative and occupational medicine. Most recently, prior to his retirement, he was Medical Director of Concentra Urgent Care in Harrisburg. I find it rather poor that the Royal Mint should have misspelt Oscar Nemon's name not once but twice in its item on the new Churchill coin. I posted a comment about the typos on the Royal Mint blog and the author corrected them, which is encouraging. His hands on his hips, about to stride forwards, Oscar Nemon's 1970 bronze of Sir Winston Churchill stands at the heart of British democracy - in the Members' Lobby of the House of Commons. It is a fitting place for the work of the twentieth centuryï¿½s most distinguished portrait sculptor, and a man who earned Churchill's respect as well as his friendship. Nemon wrote in 1953 that he considered Churchill "one of the most remarkable personalities of all time", having admired him throughout the war. The two men first met at the La Mamounia Hotel in Marrakech early in 1951. Born in Yugoslavia, Nemon had lived in Britain since the 1930's, but had lost almost all his family to the Holocaust, leading him to view Churchill with the depth of feeling which brings his portraits of the statesman so intensely to life. Lady Churchill asked Nemon if she could keep the terracotta bust he made at La Mamounia because it "represents to me my husband as I see him and as I think of him." 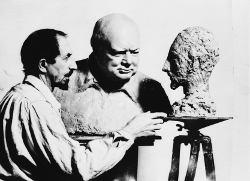 Shaped in Nemon's hotel room, it began a creative collaboration between the two men which made Nemon Churchill's choice of sculptor when Elizabeth II commissioned a bust of Sir Winston for Windsor Castle in 1952. 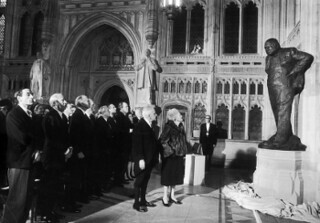 Other notable portraits followed, including a 1955 seated bronze for the Guildhall, which Churchill unveiled, calling it "a very good likeness." They reflect the energy of the sittings during which they were created. 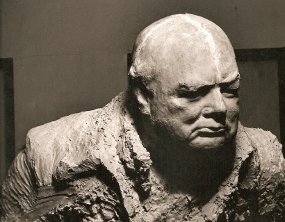 In his unpublished Memoir, Nemon recorded finding his distinguished subject "bellicose, challenging, and deliberately provocative" The resulting sculptures became "not merely a likeness, but a biography of his life" - as Nemon had told a journalist he hoped they would when interviewed while sculpting Churchill during the 1950s. Nemon was himself the subject of Churchill's only sculpture, created while Nemon was sculpting Churchill, and now on display at Chartwell and in the Churchill Musuem. 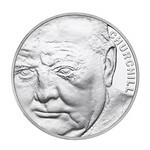 Nemon's bronzes of Sir Winston Churchill are now to be found all over the world. They stand in Bletchley Park, Chartwell, Churchill College Cambridge, the Cabinet War Rooms, The Guildhall, and the Houses of Parliament in London, St. Margaret's Bay, Dover, in Westerham, Kent, at Windsor Palace, in Brussels, Copenhagen, Luxemborg, Monte Carlo, Moscow, Paris, Zagreb, Israel, Quebec, Toronto, Edmonton, Fredericton, Halifax, Kansas City, Hyde Park, New York State, Canberra and Mexico City. Readers might ask whether the fiftieth anniversary of a death of even someone as significant as Churchill warrants the issue of a coin. The portrait on this coin is striking and the design is unusual. Although he photographed well it is difficult to convey his character on a coin. The original Churchill crown is probably one of the most unsuccessful (from a collector's point of view) commemorative coins ever because of the vast numbers produced. With regard to David Pickup's comments, I wonder why numbers issued should affect the success of a coin from a collector's point of view. 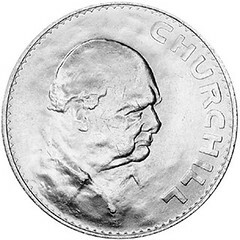 From an investor's, maybe, since they have never appreciated in value; but as for collectors, just about every collector in the world should be able to get the original Churchill crown, so why is this a bad thing? In your article on THE ROYAL MINT'S 2014 REMEMBRANCE DAY COIN you included some nice photos of the art installation titled “Blood Swept Lands and Seas of Red” which has captivated London for the past few months. Artist Paul Cummins created an impressive arrangement of 888,246 hand-made ceramic poppies, each one representing a British or Commonwealth soldier who died during WWI. 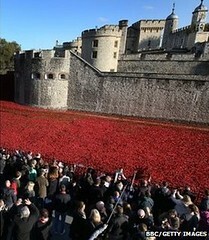 The poppies spilled out of one of the Tower of London’s windows and flowed into the dry moat which surrounds the Tower. Unfortunately, this impressive and solemn display got too little coverage in the United States. I lived in London in 1997, and the Tower of London was one of my favorite places. The castle, which sits on the banks of the Thames and dates back 1000 years, has played a prominent role in England’s history, including its numismatic history. My daily commute allowed me the option of exiting the Tube one stop early and then walking past the Tower of London to pick up the final leg of my journey a few blocks away. I never tired of the view to my right as I hurried to the next station. While I was in London the dry moat was unutilized and inaccessible, but I do recall that some archeological excavations were underway in part of it. In a letter that I had written to the person in charge of the excavations I suggested that when they were done they should fill the moat with water and stock it with alligators. Artist Paul Cummins obviously found a better use for it. I note that E-Sylum membership has now reached 1792. May I suggest that you freeze membership at that number and accept no additional subscribers? Of course, it would be a shame to limit the growth of The E-Sylum and deny its benefits to others. Perhaps you can come up with another phrase, such as "The E-Sylum now has 1792 subscribers and 100 additional readers" or "The E-Sylum now has 1792 subscribers and 200 additional participants." You might think of something more creative. Can any of the E-Sylum readers tell me when the term "Roman proof" was first used in numismatic literature, and by whom? Also, who first used the term "wire edge" to describe the thin fin found where the rim and edge meet on some gold coins? Dennis Tucker and I were hoping the E-Sylum readership might be able to help us with a book we’re working on. We’re seeking an image/portrait of George N. Eckert, director of the U.S. Mint from 1851–1853, and we seem to be coming up short! There must be an image out there somewhere but if there is, I can’t find it! I enjoyed your response on the Davis Flight Medals in last week's installment of The E-Sylum. Alan V. Weinberg made a response on Kent Whiting's piece also. He said something that bothers me. His last sentence is, "The Union paid off the surrendering Confederate rag tag soldiers from this treasury." In all of my reading and research I have never seen any reference to the Union paying Confederate soldiers. Have you seen anything? Besides, the Union did not have the Confederate Treasury at the end of the war. They spent years afterward looking for the Confederate Treasury. It is well documented that the Confederate Treasury had a large quantity of Mexican specie. The following if from my book, The Lovett Cent; a Confederate Story. "In the Western states, cotton and tobacco were shipped through Mexico, and the sellers received Mexican specie in payment. Capt. Carter, (Carter House, Franklin, Tenn.) writing as a war correspondent under the name of Mint Julep for the Chattanooga Daily Rebel, describes the cotton trade along the Texas/Mexico border in February of 1863." 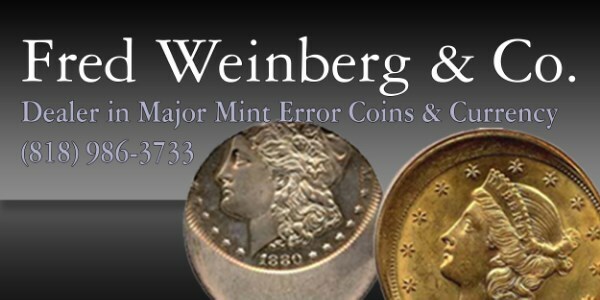 Mr. Alan Weinberg has the most impressive collection of Confederate engraved coins I have ever encountered and I’m quite honored that he has very generously given permission for me to show them in my book in progress. For these notes, however, I’d like to respond to his comments on Kent Whitings’s Davis Flight Medal shown in last week’s issue. Alan is correct that Mexican silver 8 reales coins made up the lion’s share of the Confederate Treasury’s silver coins, but they were not the Treasury’s only money. To be a bit more precise, before the Treasury train left Richmond on April 2nd, Treasury clerk Mann S. Quarles put together a quick description of the containers. Most of the hard money was packed in wooden kegs and consisted of Mexican silver dollars (8 reales coins) with some US silver dollars mixed in. But there were also gold coins, specifically boxes of US double eagles packed five $5000 sacks per box, and two boxes of English gold sovereigns worth about $35,000. Additionally there were silver bricks and gold ingots and nuggets packed in chests and barrels as well as a chest of jewels donated by Southern women to the Cause. Unfortunately, Quarles did not inventory the amounts so everything was casually estimated at about $500,000. In light of unrecorded payout amounts and the inventory of April 7th, however, I believe the total was probably more like about $375,000. Not included in the total were millions in Confederate banknotes and bonds and about £18,000 sterling in Liverpool Acceptances (only negotiable in England). It required eight wagonloads to get everything from the Confederate Treasury offices to Richmond’s train station. Also, to prevent being robbed by federal looters, the private deposits of the Richmond banks were loaded on the same train but kept separate from the Treasury funds. The Treasury Train departed Richmond on April 2nd and arrived at Danville early the next morning and began redeeming Confederacy currency for silver coin at the rate of 70 to 1. They also paid out “unknown amounts” for informal requisitions. On April 7th the Treasury left and moved by rail through Greensboro to Charlotte, NC. While en route, Capt. Micajah H. Clark, formerly the executive office chief clerk, placed the first precise value on the treasury at $327,022 (excluding the currency and the Acceptances). As the train passed through Greensboro, Parker left $38,000 in silver coin and the two boxes of gold sovereigns for the use of President Davis and the cabinet. The gold sovereigns were sent on to Davis in Charlotte, but General Johnston appropriated the silver coin to pay his army (see my remarks, last issue). Mr. Weinberg closes by noting “The Union paid off the surrendering Confederate rag tag soldiers from this treasury.” I would respectfully request that Mr. Weinberg kindly share his source for this statement. I’ve noted how General Johnston took charge of the $38,000 left in Greenville and ordered it paid out to his troops. The $35,000 in gold sovereigns remained intact until the very end (May 19th). When the Treasury train left Greensboro it still had about $254,000 (excluding the currency and the Acceptances) and the Virginia bank funds. All this remained pretty much intact until May 4th when some $108,000 in silver coin was paid out to escorting troops, Clark broke up the balance to prevent its seizure by Union looters, and the bank funds were deposited in a bank vault in Washington, GA. The point is that at no point did Union forces have control over any of the Confederate Treasury, much less pay surrendering Confederate troops with it! -Clark, Capt M.H. : The last days of the Confederate treasury and what became of its specie: Southern Historical Society Papers, Volume 9, 542. The first looks to be a post-Centennial Expo piece, perhaps homemade. The second really grabbed my attention! It was obviously was a centennial for the U.S.O., the United Service Organizations, an umbrella organization of six charitable organizations, including the Y.M.C.A. and the National Jewish Welfare Board! Oops! It couldn’t be a centennial of the USO because it was founded at the request of President Roosevelt early in 1941. Still, it was obviously a centennial for something. With a figure (crossed cannon and bomb) that anyone would associate with the military, maybe it was for a 100 year celebration of a Revolutionary War fort. 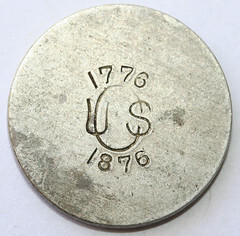 There are known tokens from eight locations in the U.S., namely Pine Bluff in Arkansas; Benicia in California; Rock Island in Illinois; Aberdeen in Maryland; Picatinny, Raritan and Rockaway in New Jersey; San Antonio in Texas; one in Tokyo; and one maverick, which used tokens. Three had pictures on the tokens of a flaming bomb (Rock Island, Tokyo and the maverick) and the Rock Island also had the crossed cannon pictured. The Rock Island token is the only one which pictures what is on Mr. Schenkman’s token. I have seen a design like that on the token but I can’t place it. Perhaps a military insignia or shoulder patch? A location not on the list offers a tantalizing twist: Ft. Adams in Rhode Island was originally formed as what I had called a “fortification” in the town in 1776! That knowledge is merely a coincidence in the context of these comments but, on further study of Ft. Adam’s history, it is reported that in recent years the fort had in operation an Ordnance Department! Could it be that a Company G (the countermark) at Ft. Adams decided to celebrate 100 years of apparent continuous operation of a Revolutionary War fort? Here's a photo of Eliasberg that most readers probably haven't seen - it comes originally from the Baltimore News American. Can any E-Sylum reader identify the coin in his left hand? 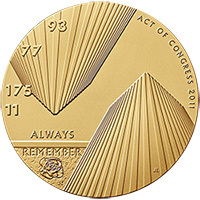 How refreshing to see the design of the latest Congressional Gold Medal, the Fallen Heroes of New York Medal. It is different from the usual. To honor the thousands killed in the September 11 twin towers disaster something different was required. It bears the perspective of looking up from ground level as the new towers rise above. The design is the creation of the talented coin and medal artist Joel Iskowitz, a long-time member of the U.S. Mint's stable of commissioned and infusion artists. "The subject required something different," Joel tells me. He employed the seldom used art technique of change of perspective to achieve that effect. 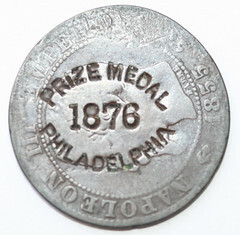 It is not completely new in U.S. Mint medals however, as Chester Martin employed this technique on an earlier Mint medal. To the human eye looking up where tall buildings emerge toward the center is a realistic perspective. It is like railroad tracks come to a point in the distance. The first such use of this perspective I recall was an Israeli medal of a forest with tree tops coming together in the center of the medal. Another dramatic design was a patient's view on an operating table looking up into overhead lights and surgeons' masked faces on a Paris Mint medal. The opposite of this is looking down on a scene, like a bird's eye view, widely used for map medals, or a layout of exposition grounds for a world's fair. These perspectives have technical names. Looking up is called vaulted perspective, looking down is called aerial perspective. The normal view is called linear perspective, so common it is hardly noticed. Point your finger at a scene or person. What you see down your arm in that view is linear perspective. Most all coin and medal designs are this perspective that is why it is so refreshing to see a change of perspective. 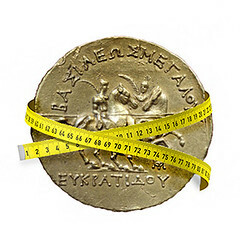 For the coin or medal cataloger any different perspective should be mentioned in a formal description. No need to mention linear perspective, it is so common. This is exactly the “look” of an early gold coin that one would want. Just a hair's breadth from full mint state, nice luster and – most important of all – with original green & gold toning that is absent from nearly all early gold remaining on planet earth. This issue was to be the highlight of the collector's set, so he wanted it to be a stunner. I believe he has succeeded. 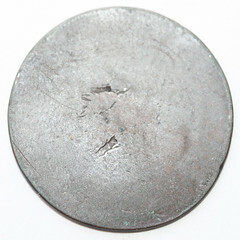 1831 Bust Quarter. PCGS graded MS64. Ex Eliasberg. $27,000. 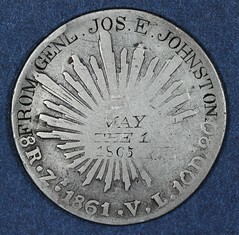 This medal – which at 40mm is nearly the size of a silver dollar but thinner – was so cool that I had to buy it. The design is terrific, the condition is excellent, the toning is pretty. 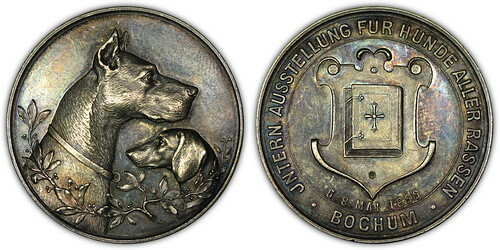 It refers to the May 5-8,1899 Bochum International Fair. A great item for collectors of medals from the Bochum International Fair. I guess it might appeal to dog lovers as well. 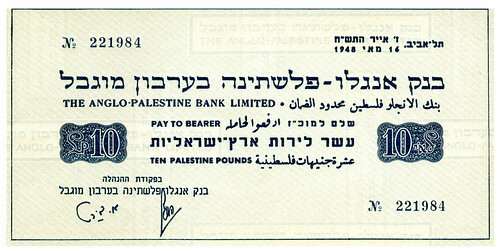 $195. Italy / Greece, The Siege of Corfu 1716, Venetian Victory over the Turks, Reichsgraff Marshal Matthias Johann von der Schulenburg at the Siege of Corfu and the erection of his statue, Copper Medal, by Georg Vestner, the statue on its plinth with the city of Corfu behind, rev legend in oval wreath, 38mm (Voltolina 1391). Extremely fine with mint redness. 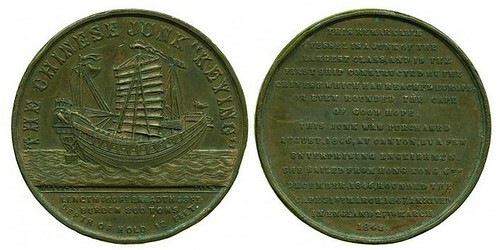 Victoria/China, Voyage of the Chinese Junk Keying, 1848, Bronze Medal by T Halliday, published by Allen & Moore, Birmingham, starboard view of the junk with sail set on main mast, THE CHINESE JUNK “KEYING”, rev details of the vessel, its purchase and its voyage, in 15 lines, 45mm (BHM 2318). A few edge bruises, otherwise about extremely fine, with traces of original gilding remaining. In December 1846, the Keying, a Chinese junk purchased by British investors, set sail from Hong Kong for London. Named after the Chinese Imperial Commissioner who had signed away Hong Kong to the British, manned by a Chinese and European crew, and carrying a travelling exhibition of Chinese items, the Keying had a troubled voyage. After quarrels on the way and a diversion to New York, culminating in a legal dispute over arrears of wages for Chinese members of the crew, it finally reached London in 1848, where it went on exhibition on the River Thames until 1853. It was then auctioned off, towed to Liverpool, and finally broken up. In this account of the ship, the crew and the voyage, Stephen Davies tells a story of missed opportunities, with an erratic course, overambitious aims, and achievements born of lucky breaks—a microcosm, in fact, of early Hong Kong and of the relations between China and the West. Mandarin Hesing of the Junk Keying, 1848. Victoria/China, Mandarin Hesing of the Chinese Junk Keying, 1848, White Metal Medal by T Halliday, bust of Hesing, almost facing, in traditional Chinese jacket decorated with dragon motif, MANARIN HESING OF THE CHINESE JUNK, rev details of the vessel, its purchase and its voyage, in 15 lines, 45mm (BHM 2317). Extremely fine. 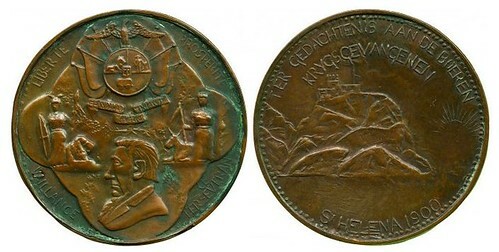 South Africa, Prisoner of War Camp on St Helena, filled Bronze Medal, 1900, images relating to South Africa, rev the prison on the island, depicted as a high rocky landscape, TER GEDACHTENIS AAN DE BOREN, KRYGEVANGENEN, 46mm (Hern 298, smooth “COA” variety). Extremely fine and rare. The medal was made by prisoners of war with very limited facilities. It is made of two plates joined by a rim and the centre was filled with cardboard. LOT 4414: underrated French print specimen. This is a beautiful design and highly elusive in this form. LOTS 4415, 4419, 4434, 4437, and 4440: replacements for the 1950-60s pieces have always been extremely difficult to find. We offer five different in the Annam Collection. LOT 4461: tough color trial. A gem piece, this dazzler is the first we have ever offered. Not generally available on the market. Make the most of this outstanding opportunity. 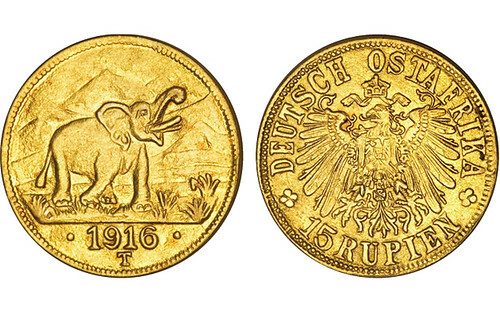 On December 8, 2014, Numismatik Lanz invites to auction sale #159. The focus is laid on ancient coins. 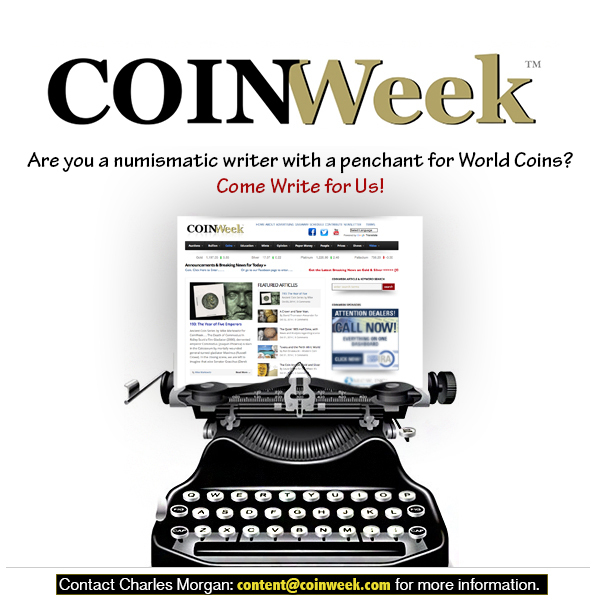 The world coin section offers two special collections: The Ducats of Venice and their Imitations as well as Universitas in Nummis. On December 8, 2014, Numismatik Lanz conducts auction sale #159 in their premises, Maximiliansplatz 10 in Munich. Almost 1,000 lots will be for sale. A first focus is on ancient coins with Celts, Greeks, Romans and Byzantium. The Roman-German Empire and the foreign countries are present, too. The sale is highlighted by two special collections: the Andreas D. Mazarakis Collection featuring Venetian ducats and their Anatolian imitations as well as the house collection of the fraternity Austria / Vienna of Universitas in Nummis. The offer includes more than one thrilling piece that will certainly exceed its pre-sale estimate by far. 18 Celtic coins are the auction’s kick- off. They include a rare, so far unpublished piece, a Germanic imitation of a siliqua of Arcadius dating from the 5th cent. (17, EF, 1,500 EUR). Next in line are more than 250 lots of Greek coins. Only one, extremely rare piece may serve as an example for the many fractions included in this sale, an Archaic obol from Poseidonia depicting Poseidon in the ‘Knielaufschema’ (28, EF, 1,200 EUR). 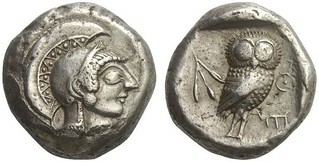 Considerably higher will be the sum to be paid by the new owner of the tetradrachm from Acragas with the depiction of two eagles gorging the hare on the reverse (36, EF, 15,000 EUR). From Camarina comes the gold litra with the head of Athena of its obverse (40, ab. EF, 9,000 EUR). 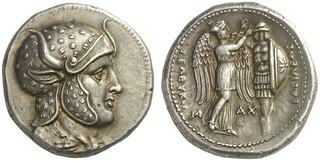 A very rare subject is encountered on the reverse of the didrachm from Panormos (48, EF, 15,000 EUR). The dog depicted there belongs to the Tesem, a type of dog that was already known to ancient Egyptian art and disseminated probably by sea-faring peoples. Apart from that, the auction offers a rich selection of Macedonian pieces, including a tetradrachm from Olynthos which can be considered the quintessential Classical coin (79, EF, 10,000 EUR). Not yet fully explained is the attribution of another piece, an octodrachm from the time of Alexander I (82, EF, 20,000 EUR). Either Alexander himself was the minting authority or the tribe of the Bisaltae. A superb posthumous stater of Philipp II, which exhibits the well-known portrait that is sometimes identified as Alexander the Great (90, EF, 5,000 EUR), leads over to a series of coins from Demetrius Poliorcetes, including lot #115, a veristic likeness with the artist’s signature (115, EF, 4,000 EUR). A number of Athenian tetradrachms comes next, which, amongst others, features a magnificent piece on a broad flan that features even the helmet’s crest of the city goddess (198, EF, 25,000 EUR). The Seleucids surprise with an extraordinary tetradrachm of Seleucus I, exhibiting a clear-cut portrait of the great Alexander (264, EF, 6,000 EUR). Spectacular highlight and final item of the Greek coins is an exceptionally well struck tetradrachm from Cyrene, minted around 460, depicting the silphion plant on the obverse and the Archaizing head of Zeus Ammon on the reverse (272, EF, 20,000 EUR). The section of Roman coins start with a series of Republican denarii with lot #274. The expressive portrait of a wild barbarian can be encountered on the denarius of the mint master L. Hostilius Saserna (307, EF, 3,000 EUR). Just 120 Euros is the starting price of an extremely rare quinarius of M. Iunius Brutus (312, VF, 200 EUR). This piece once again testifies to the fact that it takes only little money for the attentive collector to acquire exciting rarities. Gold, silver or bronze, there are all denominations of the Roman Empire found in that catalogue. Rarities are daily fare, like the extremely rare drachm whose obverse depicts the portrait of the Thracian king Rhoimetalkes (331, ab. EF, 3,000 EUR). Representing the rare bronzes is the medallion of Hadrian featuring owl, eagle and peacock on the reverse as attributes of the Capitoline Triad (428, ab. EF/VF, 2,000 EUR). The marvelous aureus of Aelius Cesar with Concordia enthroned should not go unmentioned, either (457, EF, 15,000 EUR). Special emphasis deserves the extraordinary double aureus of Gallienus of which only two examples have been known so far (553, EF, 10,000 EUR). That the coinage of the barracks emperors needs not to be boring is proven by exceptionally rare antoniniani with fascinating unusual bust types, like the ones of Gordian III (537, ab. EF, 800 EUR) and Aurelian (558, ab. EF, 1,000 EUR), or rare reverses like the quinarius of Probus with the muse Calliope (565, EF, 1,500 EUR). Rarities from late Roman times, like the solidus of Constantinus II from Thessalonike (597, EF, 15,000 EUR), lead over to the Byzantine section. The biggest rarity there is a gold hyperpyron of John II Komnenos, the emperor shown in the famous Hagia Sophia mosaic (644, EF, 15,000 EUR). 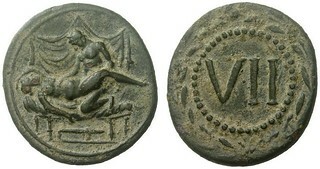 Let us conclude the preview of ancient coins with an extraordinarily well preserved spintria (657, EF, 6,000 EUR). At the turn of medieval to modern times, at the border between orient and occident the collection field of Andreas D. Mazarakis is located: the ducats of Venice and their imitations. The geographic spectrum ranges from the Crimea and the Greek islands to the Ottoman Empire and India. Mr. Mazarakis is the author of the work of reference “Die Dukaten von Venedig und ihre Imitationen aus Anatolien vom 14. – 16. Jahrhundert”, published in Athens in 2012. It comes as no surprise, therefore, that his collection includes great rarities, like, for example, a ducat of the Genoese colony Pera which produced these pieces for their trade with the Black sea region (671, EF, 3,000 EUR). The Roman-German Empire follows next, which – as usual with Lanz – also subsumes Germany. The connoisseur discovers, amongst other items, a Brunwick loser of 4 thaler from the Ferrari Collection from 1662, minted in Clausthal, featuring the horse of the House of Welfen jumping across a mine which is rendered in great detail (765, EF, 6,000 EUR). The world coins come up with two Chinese showpieces. 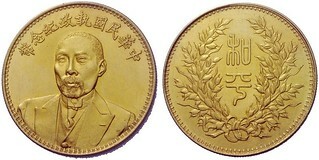 The gold 1 dollar piece n. y., minted in 1916 by order of Yuan Shikai (802, ab. BU, 20,000 EUR), exhibits in a splendid uniform the man who was the last central power of the Chinese Republic. Shortly after his death, the civil war began. One of the most powerful figures of this conflict was Duan Qirui who was also one of the warlords. 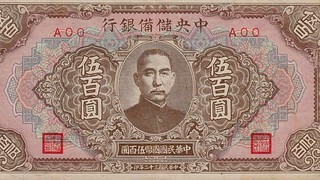 His half-length portrait can be seen on a gold dollar n. y. from 1924 (803, ab. BU, 20,000 EUR). For the special collectors a small series of coins from Nepal and some Russian coins should be emphasized. The auction sale is concluded by the house collection of the Catholic Austrian Students’ Fraternity Austria, Vienna. It consists mainly of medals addressing the university topic. The special collector is given the splendid opportunity to acquire interesting pieces for little money only. You may join the bidding with just 30 euros. It goes without saying that more expensive items are available for sale, too, like the very rare 1 ¼ ducat 1756 on the completion of the Vienna University building (853, ab. BU, 4,000 EUR). This collection of nearly 90 pieces was carefully assembled by a very discriminating numismatist and features an incredible sample of large and impressive copper “coins,” ranging from 1/2 Daler to 4 Daler sizes. The plate money was issued as a replacement for silver and gold coinage, as specie in these metals were scarce, but copper was readily available in massive quantities. These large “coins” were issued from 1644-1776 in denominations from 1/3 Daler to 8 Daler. The copper came not just from mines but also from cannon barrels that were repurposed and used to produce these coins (similar to Irish “Gun Money” of 1689-1690). 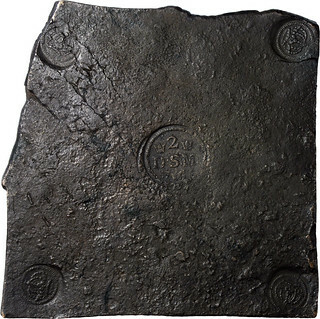 Many known examples of Swedish Plate Money came from the wreck of the Nicobar, and that find provided a good cross section of this interesting area of numismatics. The analysis of the varieties and types recovered from this wreck has offered a wealth of information about this specialty. Stanley Aberdeen began collecting these pieces when Ponterio & Associates sold the plates recovered from the wreck of the Nicobar. As his interest in the series grew, Mr. Aberdeen’s search widened to include Europe, and he worked with several agents as certain rarities appeared at auction. With such great sources of material, he was able to acquire better quality examples than usually seen. As a result of his keen eye and good sense of historical context, Mr. Aberdeen’s assemblage contains not only “regular issues” but also a number of very rare siege pieces. 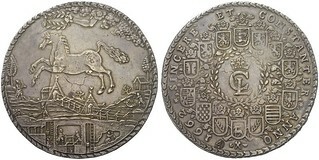 2 Daler Plate Money, 1716. Stockholm Mint. Very Fine. Struck from metal recovered from recycled cannons. Extremely rare, only 19 examples known. Very Fine. 2 Daler Plate Money, 1674. Type with a star between two lilies, denoting copper source as Garpenberg. Extremely rare, only 6 known examples. Very Fine. Ex: Cavalli Homberg Sale 103 (1913) lot 11. 4 Daler Plate Money, 1718. Rare, 30 examples known (including 7 that were on the Nicobar). Extremely Fine. Reportedly found in a well, ca. 1834. 3 Daler Plate Money, 1718. Extremely Rare, only 13 examples known. Revalued to 3 Dalers on a 2 Dalar, 1711 of Avestra. Very Fine. Wismar. 8 Schilling Plate Money, 1715. Extremely Rare necessity coinage made from repurposed guns at the siege of Wismar during the Great Northern War. Extremely Fine. Ex: Gustaf Cavali; General Konsul Axison Johnson; Avestra Mynt Museum; Jim Karlson; Upssala Collections. 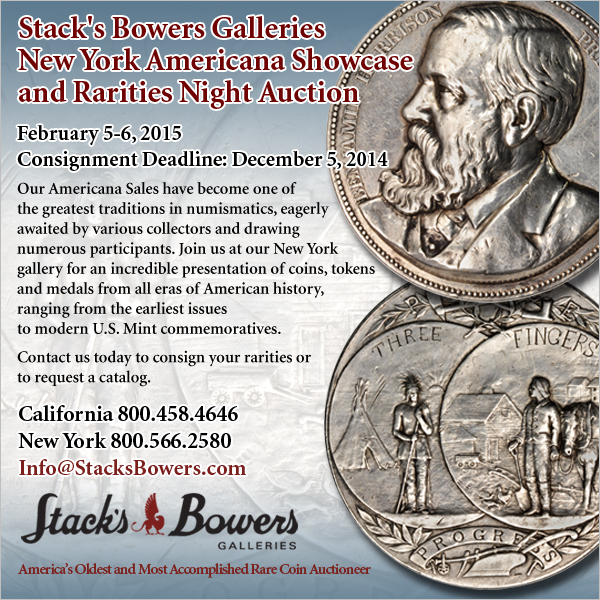 “A collection of such wide range will not likely be offered in the near term, so we suggest that interested numismatists review the descriptions of these wonderful items, and contemplate their place in the annals of numismatic history,” said Richard Ponterio, executive vice president of Stack’s Bowers Galleries. Aside from The Stanley Aberdeen Collection, the Stack’s Bowers Galleries Official Auction of the NYINC includes many other important collections, including The Ray Czahor Collection of Philippine Countermarked Coinage, The Rockaway Collection of German Crowns and Talers, The John Adams Collection of Spanish Colonial Proclamation Medals, The Ancient Coins From The Richard Aghababian Collection, and further selections from The Demarete Collection. 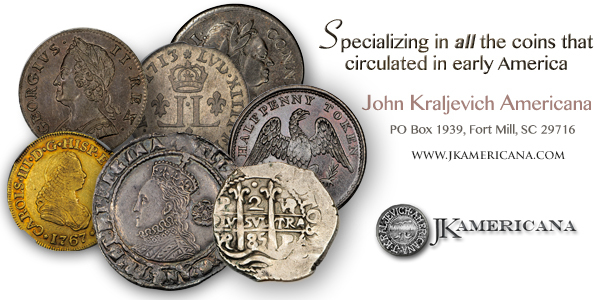 Other important properties include a fine selection of Spanish and American Administration Philippines coins, gold coins of Brazil, a wide range of coins from Russia, and a specialized collection of Judean coins. On November 28th the Brazilian Central bank will release the biggest numismatic coin launch in the history of modern numismatics in Brazil. As a part of the Olympics Numismatic Program, a total of 13 coins, in different finishing: four 1 Real coins intended for circulation, four 1 Real coins in a BU blister, four Proof Silver R$5 coins and a gold R$10 coin. The first problem is the number of different coins sold all at once, 13 is a very big amount of different coins for the Brazilian market, in recent years there were only three or four coins released each year. Early this year 9 coins were released to celebrate the FIFA World Cup (six R$2 coins in Copper-Nickel, two Silver Proof R$5 coins and a gold R$10 coin). 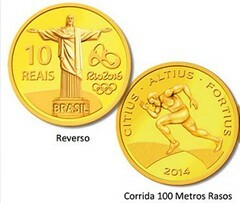 Only two out of the nine coins were an outstanding success: the R$10 gold one and the R$2 themed “The Goal”. For a market that used to have only a handful of coins for collectors released each year, 22 coins in a single year is a very big number. The second problem is the price, for a coin that has only 27 grams of 90% silver the price is very high: US$76,00. This is a problem also with the gold coin: 4,4 grams of 90% gold for US$460,00. The R$1,00 in a Brilliant Uncirculated blister is more affordable: US$5,00 each. And of course the R$1,00 coins will be available for R$1,00 (40 cents, today’s price). For a collector to buy all the coins, he or she will pay US$788,00, a very big amount of money when converted to Reais. Also, the Coins will be sold only in 10 cities across the country: if you don’t live in those cities, tough luck, you will have to buy from the Brazilian Bank website (that usually runs out of stock in hours), or at your local coin dealer. But if a person buys at a coin dealer, he or she will spend almost US$900,00, making the complete set even harder to accomplish. That’s the challenge: how to sell those overpriced coins to a market that is not accustomed to receive a big amount of coins each year? The answer may be very difficult for the Brazilian government to find. Nigeria’s Regulatory Bank, The Central Bank of Nigeria, has introduced the first digital bank note in the world. The new 100 Naira note is part of Nigeria’s Centenary celebrations. 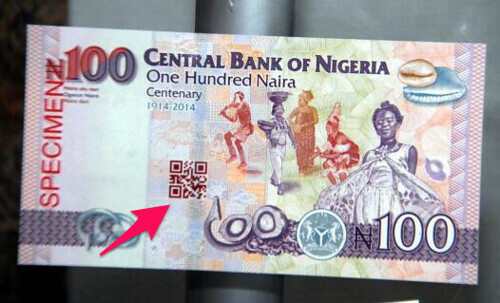 The 100 Naira note has printed on its back, a QR Code (QRC). This particular QRC is a feature that highlights and sources all the information about the centenary. The QRC is an application found on the smart devices. Once the barcode on the back of the note is scanned it shows the President’s face and then comes up with all information on Nigeria’s history. Facts and logic suggest it would be highly improbable for the jihadists to issue their own coins of any meaningful consequence. The numbers and the logic just don’t add up. The reports indicate that copper, silver and gold coins are planned. 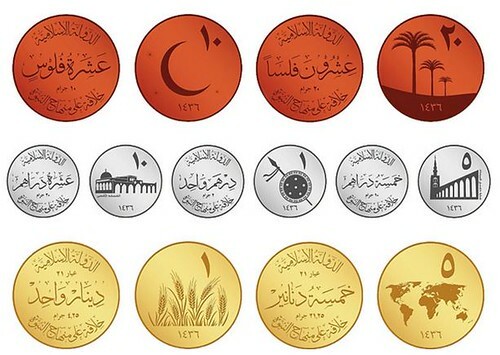 Naturally, images purported to represent these coins feature imagery that is significant to Islam and the region. This is no surprise, given that coins have served as mediums of communication since ancient times. 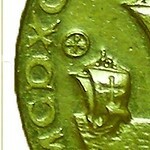 Whether showing the rose of Rhodes to identify the issuing city, or touting the accomplishments of a Roman emperor for propagandistic purposes, or honoring a fallen statesman like President Franklin D. Roosevelt on a coin linked to his health struggles, coinage has and does represent more than mere media of exchange. The article goes on to ask and explore questions such as "Can they obtain the metal and presses?" and "Could ISIL order its coins from a mint?" With so many other unofficial coins in the market, I am guessing these will become available in the next few months. Not from IS, ISIL, ISIS, but from some savvy marketer. Minting equipment may be hard to come by, but there are instances of emergency issue coins being struck by armies on the run. 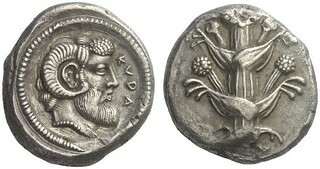 Look to Emperor Sulla in ancient Rome, or more recently, the famous German East African elephant coins struck in Tabora. In both instances, engravers of varied skill created dies and formed gold so coins be struck the old-fashioned way, using a little muscle and sweat. Because they are not machine-produced, they would lack the precision that we have come to expect with coins. Their crudity, then, would not match the design renderings released thus far. Many collectors are more or less familiar with the story of Emperor Norton I, who lived in San Francisco during the later years of his life. Joshua Abraham Norton was born in England on Sept. 17, 1819. He was a businessman during his earlier years. He came to San Francisco in 1849 with a tidy sum that he used for investment in the local rice market. Just as he was about to cash in, two ships laden with rice arrived and caused him to go bankrupt. This occurrence affected him to the point that he became irrational. It was apparent that he had lost his sense of reason as well as his identity. In 1859 he proclaimed himself “Norton I, Emperor of the United States,” adding “Protector of Mexico” to his title a little later. He was good-naturedly accepted by the city. His needs were given freely, and he had the “keys to the city” in effect. 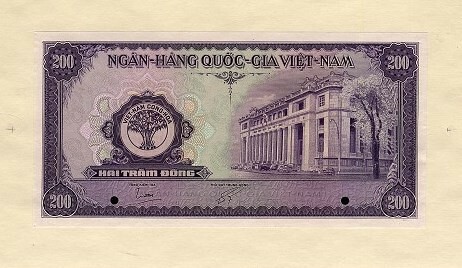 Sporadic paper money issued by him was for small denominations that were accepted by the population. He died from apoplexy on Jan. 8, 1880. Many thousands of people attended his regal funeral. 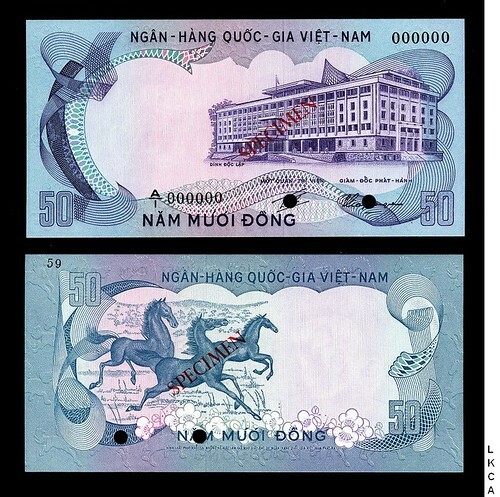 The piece shown here bears no resemblance to any genuine notes Norton issued. It is dated “Issue of 1953” and I cannot figure out why. It does not coincide with any anniversary of anything pertaining to Norton that I can ascertain. I believe the San Francisco Chronicle backed him in many ways; that is why it is mentioned on the back. If anyone has any information as to the background of this “Gold Crown” I would appreciate knowing about it. You can always write to me at nelsshaf@aol.com. 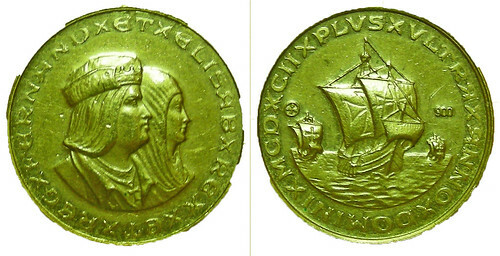 I have a medal (medalet) commemorating the 1492 voyage of Christopher Columbus - 3.7g gold and 17 mm, likely issued in 1992. It has a hallmark of four P's in the form of a cross. How do I research the origin / maker of this medal? I have tried various internet searches and cannot find it. A photo is attached. Any direction E-Sylum can give would be appreciated. Or call or email us. A limited number of printed paper catalogs are also available which we will make available to any E-Sylum reader gratis as long as our supply lasts. Most lots will be available for viewing at our table at the Aurora, Colorado show November 29th. I'm attaching photos of a love token I picked up at the Whitman Baltimore Expo. 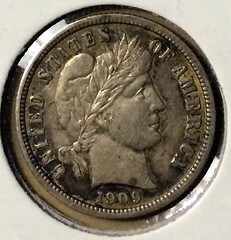 The host coin is a 1909 Barber dime. 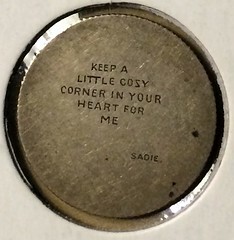 The reverse features a line from a 1905 sentimental ballad by Theodore F. Morse --- "Keep a Little Cozy Corner in Your Heart for Me" --- and is signed by "Sadie." The dime is in nice condition, so I imagine it was planed and engraved some time in 1909 or 1910, before it saw much if any circulation, and then it was set aside in a safe place for generations. I've never seen a love token with such a plain, text-only inscription (no flourishes, scrolls, or fancy monograms). And this is the smallest font I've ever seen on a love token. I wonder if any E-Sylum readers have seen one of similar fabric published in any of the numismatic journals or elsewhere? 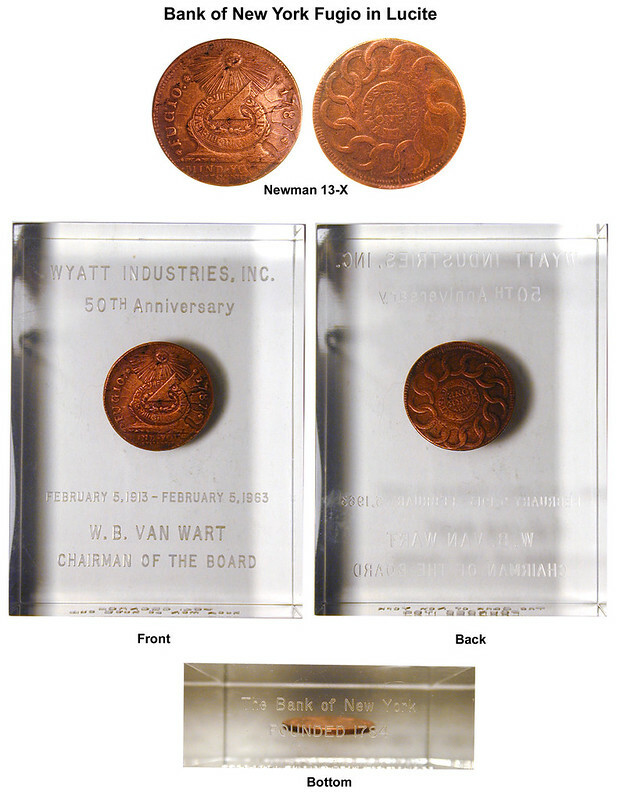 I enjoyed the article on extracting a coin or medal from an acrylic block. I've been reasonably successful in removing coins, medals, tokens, etc. from acrylic blocks by doing essentially the same thing: freezing the block for a day or two, then having a hammer and something solid nearby, taking the block out of the freezer and hitting the edge of the block hard with a hammer. This generally removes a big chunk of the plastic and exposing the item inside. If it doesn't, then I hit it again until some part of the item is exposed to the air. I then heat of a pan of boiling water and carefully drop the partially encased item into it. Since most of the encased items are metal, the metal expands faster than the plastic, and the rest of the plastic easily comes off. Of course, if the item encased in the acrylic isn't metal, this might not work as well, but still worth a try. Hope this helps. In the mid 1960s, the U.S. government was winding down the exchange of silver certificates for silver dollars. 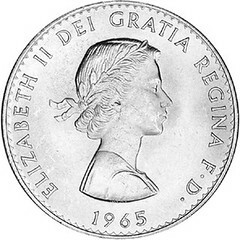 After the program was terminated in 1964, the government had a large supply of original mint sealed bags of silver dollars. From October 1972 to June 1974 the U.S. Treasury offered five sales of silver dollars, consisting mainly of Carson City coins. The hoard was dubbed the GSA (Government Services Administration) Hoard; it was the branch of government in charge of the dispersal of the coins. The hoard consisted of more than 3 million coins, most of which were minted in Carson City, Nevada. Until the discovery of this hoard, CC dollars were thought to be relatively scarce in high grades. Approximately 125,000 coins were discovered to be from other mints, and coins ranged in condition from heavily circulated to uncirculated. During the first two years of the sale, approximately 1.96 million coins were sold for about $55 million - the largest volume of rare coins ever sold worldwide. The uncirculated non-CC GSA coins come in a plastic holder that labeled them as "Unites States Silver Dollars" instead of the standard "Carson City Silver Dollar," and can also be found in soft packs as well. The GSA hoard contained up to 84% of the entire mintage of some CC dollars. The U.S. government had five mail bid sales between October 31, 1972 and June 30, 1974. The sales limited collectors to the purchase of only one of each date per household. The 1879, 1890 & 1891 coins sold out rather quickly and the rest met mild enthusiasm. As of the last sale date in 1974, the government still had about one million CC coins left. They lay dormant until 1979, when the president signed legislation to authorize the sale of them at a set price. 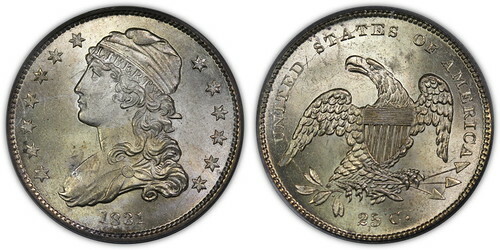 In early 1980, this set price was retracted just a month before the coins were scheduled to sell in another round of mail bids, due to a runup in the silver market. Originally, the 1980 sale limited the amount of coins per customer to 500 pieces. However, just 13 days before the sale began, the number was dropped to 35 coins per customer. The sale ended in July of 1980 after a hectic few months. After the sales, the coins began to show up at coin shows around the country. Many were cracked out of their original holders by coin dealers because they considered them too bulky to transport between shows. At this time, there were so many coins on the market that they did not carry a premium in the original holders. The sounds of dealers breaking coins out of holders could be heard at most major shows, as dealers begun to pack for their trips home. It was also reported that people saw trashcans full of broken GSA holders at shows as the dealers packed. With the introduction of third party grading, even more coins were cracked out of their original holders and sent in for encapsulation. The GSA hoard contained many attractively toned and high grade coins. Many of them were also cracked out of their original holders and encapsulated. All three of the major grading services attribute GSA coins in the holder. 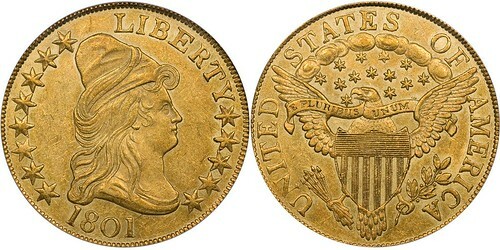 ANACS and NGC attribute them using a system where the original holders are stickered. 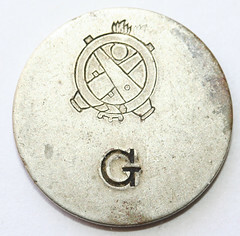 Both companies either currently or in the past have labeled GSA dollars as “GSA Hoard” pieces in their standard holders. Both also grade and encapsulate GSA coins in the soft packs. PCGS encloses the coin in a larger, plastic holder with the GSA plastic holder tucked inside. NOW WITH SUTLER TOKENS! Q. David Bowers’s Guide Book of Civil War Tokens, second edition, includes 64 additional pages of fresh research. You get updated pricing, more images, and a 50-page illustrated chapter on sutler tokens. Ships December 1, 2014; pre-order your copy now for just $39.95 at Whitman.com or call 1-800-546-2995.